Regular family meals are linked to the kinds of outcomes we all want for our children: higher grades and self-esteem, healthier eating habits and weight, and less risky behavior. National Family Meals Month is a nationwide celebration designed to underscore the benefits of family meals, and, this September, the team from Seafood Nutrition Partnership is accepting the challenge and encouraging all Americans to pledge to share one more meal at home per week with our families. Parmesan Crusted Pollock is a healthy, family-friendly dish perfect to make for National Family Meals Month. Regular family meals are linked to the kinds of outcomes we all want for our children: higher grades and self-esteem, healthier eating habits and weight, and less risky behavior. National Family Meals Month is a nationwide celebration designed to underscore the benefits of family meals, and, this September, the team from Seafood Nutrition Partnership (SNP) is accepting the challenge and encouraging all Americans to pledge to share one more meal at home per week with our families. Numerous studies underscore the long-term health, academic and societal benefits of consistently eating together as a family, yet, according to a 2013 Harris poll, only 30 percent of American families share dinner every night. Making and eating dinner at home is one way families can stay connected and share their daily experiences together as a family while enjoying a nutritious meal. “When you cook your own meals, you know what you’re putting into your food, which is often healthier -- and if you get your kids involved in cooking, they feel proud of helping and are more likely to eat wholesome foods,” said Linda Cornish, president of SNP. Seafood is fast and easy to prepare for dinner, with most dishes taking about 15 minutes to prepare -- even from frozen. The Alaska Seafood Marketing Institute offers a whole series of tasty recipes called Cook it Frozen. And SNP offers several tips and ideas for cooking healthy, balanced meals at home. Fish and shellfish are good sources of lean protein, low in saturated fat and rich in vitamins and minerals, most notably the omega-3 fatty acids, EPA and DHA. The Dietary Guidelines for Americans recommends at least two servings of seafood per week to support heart and brain health -- and currently only 10 percent of Americans eat seafood twice a week. SNP offers several recipes that are perfect for busy families, including a series of 12 Eating Heart Healthy recipes designed to feed a family of four for less than $10, as well as four cooking videos for kids by kids. 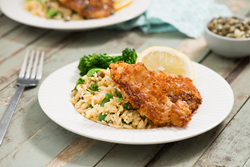 Try this parmesan crusted pollock -- a seafood dish even kids will love. 1. Season pollock with 2 tablespoons of broth and S&P. 2. Mix together parmesan cheese, panko and parsley in a bowl. 3. Coat fish with bread crumbs mixture from Step 2. 4. Heat 1/2 the oil in a sauté pan over medium heat. 5. Place fish in pan and cook on each side for 3 minutes. 6. Remove fish and wipe pan. Add remaining oil. 7. Add garlic and onions and lightly sauté. 8. Add remaining broth and lemon juice along with capers. 9. Cook until reduced by half and remove from heat. 10. Add butter and swirl until melted and creamy. 11. Served on fish along with cooked brown rice. In addition to the Family Meals Month website, the USDA’s MyPlate, MyWins campaign also offers many recipes and ideas to help busy families eat more nutritious meals together. With all the resources available, joining the movement to commit to one more meal at home per week this September is easy. For more tips, follow SNP and #FamilyMealsMonth on Facebook, Instagram, Twitter and Pinterest. Seafood Nutrition Partnership (SNP) is the leading 501(c)3 non-profit organization in the U.S. building awareness of the health and nutritional benefits of seafood. SNP is addressing the country’s public health crisis through education programs that inspire Americans to incorporate more seafood and omega-3s into their diets for improved health as per USDA Dietary Guidelines. In October 2015, SNP launched a national public health education campaign. For more information, visit SeafoodNutrition.org.